Hibs have played Ross County six times and never beaten them. They have been to the Global Energy Stadium three times and lost on each occasion. If the Easter Road side are to keep alive their hopes of reaching a third consecutive Scottish Cup final, they will have to buck a dismal trend when they head to Dingwall for a hazardous-looking fourth-round tie this Saturday. The rot set in from the moment the two sides first met in a Scottish Cup quarter-final tie at Easter Road in March 2010. County were then in the First Division, while John Hughes’ Hibs side were battling to stay in the race for third in the SPL after their blistering start to the season had started to tail off at the turn of the year. Hibs looked on course to progress when they led 2-1 through Colin Nish and Derek Riordan, only for County’s Michael Gardyne to force a dreaded replay with 11 minutes left. 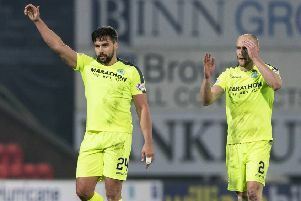 They say the smaller teams only get one bite at the cherry against more illustrious opponents, but, on a harrowing night in Dingwall, Hibs were to find, to their cost, that isn’t always the case. Once again, the Edinburgh side looked on course for a place in the semi-finals when Anthony Stokes put them ahead just after the break, but, as events unfolded, they were undone in the last quarter of the match, with Garry Wood equalising for the hosts with 20 minutes remaining before Scott Boyd scored a dramatic last-minute winner. Hibs, as is always the way when they lose to lower-league opposition, were widely criticised, while Hughes never really recovered from that grisly night in the Highlands. Hibs lost six of their next seven league games before the manager was eventually sacked after the poor form continued into the following campaign. Ian Murray was among the first batch of Hibs players to encounter the perils of Ross County and still recalls that cup tie a little over three-and-a-half years ago with no shortage of frustration and bewilderment. “It was a big moment for us in that season,” he told the Evening News. “We’d lost our way a little bit in the league, but we were still massive favourites going up there. “We had a scare in the first game at Easter Road and people thought we’d have learnt our lesson from that. I played centre-half and I actually thought it was probably one of the best games I had that season. Overall I felt we were the better team and I was pretty surprised we got knocked out because I was disappointed in Ross County over the two games. “They probably played better in the first game at Easter Road than they did in the game up there that they won. One-nil up going into the last 20 minutes, you hope to get extra-time at the very worst, so you’ve got to give full credit to them for using the home advantage to get two late goals against us. “We took a big crowd up to Dingwall and after that game, things really started to turn badly for us. The weight of expectation on Hibs when it comes to the Scottish Cup is always massive and when you go out to a lower-league team in particular it just intensifies the criticism you get. The two main differences ahead of this Saturday’s tie – the two sides’ first Scottish Cup meeting since the aforementioned encounter in 2010 – is that County, despite now being a Premiership team, are not as upwardly-mobile as they were back then, while Hibs won’t be burdened by the fear of a defeat being billed as a humiliating giant-slaying, as it was to an extent the last time. If anything, Hibs can be expected to have a slight edge as a result of the buoyancy brought to their supporters by the arrival of popular new manager Terry Butcher. “It’s always tough up there,” continued Murray, who left the Easter Road club in 2012 to eventually become manager of Dumbarton. “Ross County haven’t been doing particularly well this season, but the cup’s a different competition. Sometimes a team that’s not been doing particularly well in the league goes on a cup run. They’ve got a totally different team now to the one I played against and they’ve had a tough start to the season. “Even drawing at Tynecastle last week probably wasn’t what they were looking for. They’ll fancy their chances of bouncing back against Hibs, but, equally, Hibs, with a new manager, will also fancy their chances of coming away with at least a draw and a replay.